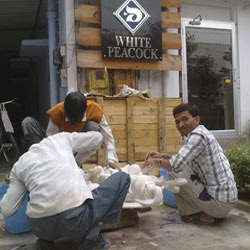 Established 2010 at Jaipur, (Rajasthan, India), we, “White Peacock,” are a well-known name amongst the leading manufacturers and exporters of Flower Pots, Ash Trays, Candle Stands, Lord Ganesh statues, Pen stands, Ganesh Lakshmi Saraswati statues, Lord Radha Krishna statues, Lord Hanuman statues and Sculptures. With our dedication and commitment, we have managed to win over clients from across the globe. Through unswerving market studies and technical up gradation of all our sculpting procedures and machinery, we have been able to fabricate products in conformity with international quality specifications to meet the changing market requirements. Empowered with a team of industry experienced sculptures, artisans and creative professionals, we have been able to provide the most appealing products of the highest quality to our clients. We have been focusing on absolute client satisfaction by offering reliable and elegant Sculptures, Statues, Sandstone Clay Artifacts and White marble Artifacts backed by affordable prices. Under the successful leadership of our mentor, Ms. Wandana Parnami, we have reached to a matchless position in the industry. Her rich industry knowledge and dedication enables us to comprehend and fabricate according to clients’ specific and standard requirements in a cost effectual manner. Manufacturing, Services, Trading and Exporter of Sculptures and Statues. Our high-end manufacturing unit equipped with ‘state-of-the-art’ technologies and manufacturing machinery helps us manufacture products of very high quality and designs, in order to suit each and every carriage need of our clients. Our manufacturing facility is segregated into a number of distinctive units which helps us in attaining expertise in every step of the manufacturing process. Our products need the best of packaging materials and packaging procedures to make sure that flawless and defect free goods are delivered at the doorstep of our clients within the promised time of delivery. Losses in storage and transit are hence, minimized. 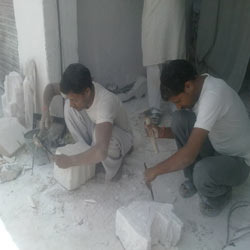 We have been manufacturing and exporting Sculptures, Statues, Sandstone Clay Artifacts and White marble Artifacts of the highest quality for our clients spread all over the country. We manufacture outstanding products of the finest finish and make. Our products are tested for their quality specifications, dependability and strength at our sophisticated and contemporary manufacturing units. As a result we are able to deliver Sculptures, Statues, Sandstone Clay Artifacts and White marble Artifacts that are easy to clean, attractive and robust. We have a team of tremendously talented artisans and craftsmen who are operational round the clock to attach knowledge and efficiency to the sculpting process which enables us to supply products of outstanding quality at unbeatable prices. The responsibilities of our workforce and their fast reaction to customer complaints and demands have enabled us to satisfy our clients optimally. 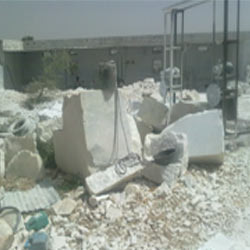 Our sourcing agents have enormous knowledge in selecting the best quality raw materials. We have exceedingly skilled designers, craftsmen and traditional artisans to design products as uniquely as possible. Our quality analyst strictly checks the finished range to ensure flawlessness in the finished products. Comprehending the requirements of our customers is the most important technique of reaching the pinnacle of success in this industry. We make sure that we completely understand the demands and the choice of our clients and we manufacture products accordingly. Finished goods can also be customized according to client specifications at our high-end modulation unit. Our customizing and modulation processes are carried by the most skilled craftsmen in the industry which helps us promise flawless modulation services for our client spread all over the world. We regard quality as our most successful attribute and its the key to our success, today and tomorrow. Our well established business relations with established and quality conscious manufacturers assist us in delivering desired output in the end products as demanded by us from our customers. Further, our well defined business approach right from understanding the order requirements to identifying the manufacturers till getting the consignment delivered at customer's end, our well defined business operations ensure our customers get nothing but the best deals from us. We understand that customer satisfaction plays a very important role in the success of any organization. So in order to live up to the expectations of our clients, we are delivering to them the products that conform to international standards. With our flawless range of products and services we have earned a never ending list of clientele.